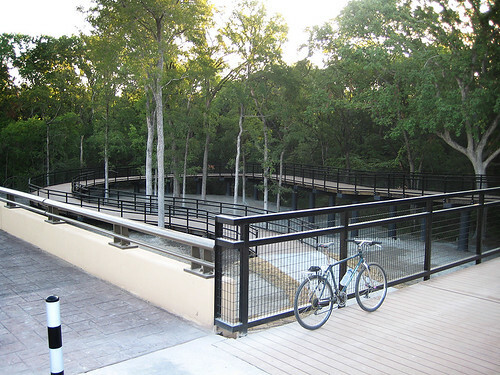 Spring Creek Trail Ramp – NOW OPEN! There is a nice little nature trail that goes through the northern, central part of my town, Richardson, Texas. According to the City of Richardson Trail Guide, it’s called the Spring Creek Trail. It has entrances on Plano Road and Glenville Drive with scenic, tree covered, twisted routes that lead to a nice rest stop at Renner Road and US-75. This rest stop is a nice jumping point to another bike trail that runs along Renner Road, which leads to the west site of Richardson. 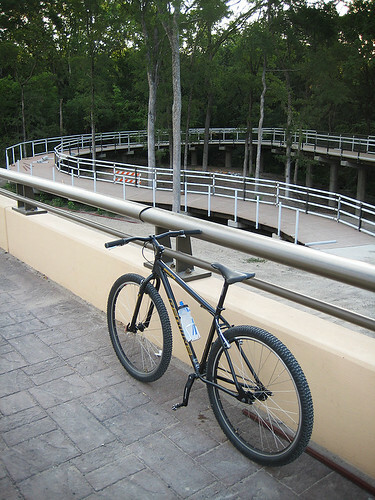 Until recently, the Spring Creek Trail was the only bike friendly route that connects to the jumping point at Renner at US-75. Most of the other routes are very busy streets and feeder roads. Within the past couple of years, Blue Cross Blue Shield of Texas has relocated to a newer place within Richardson, constructing a brand new office building just south of Spring Creek Trail. With this new building, the City of Richardson added a new road between Glenville and Renner – cutting right through Spring Creek Nature Area. At first, I was put off by how development always trumps nature and parks. 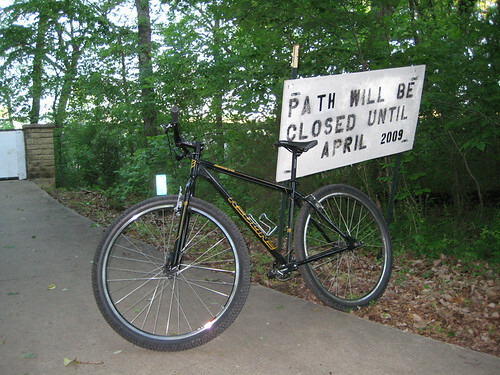 It was even more frustrating when the main part of the trail became blocked for over a year because of the construction. While riding around Glenville Road last April, I noticed that this new road, Routh Creek, was almost complete. 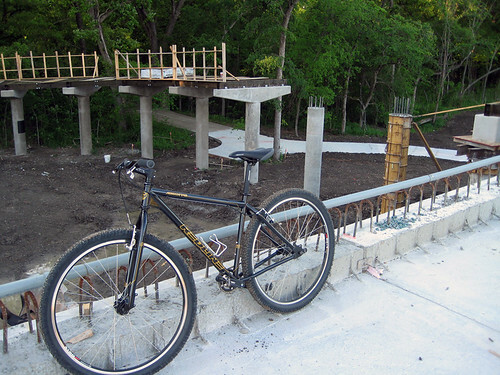 I took a spin down it to check it out, and to my surprise, I discovered that they were building a wide bike lane with a ramp to join up with the Spring Creek Trail. Like the new road or not or not, at least they kept the cyclist/peds in mind when they developed through the area. I can’t say the same for the trees and wildlife. Well, I started to get excited about this. For me, this opens up a new route through this part of town, making a quick and easy connection between various bike routes in Richardson. Over the next few months, I kept an eye on the development and waited patiently for them to complete the project. See the pics below to watch the progress through the summer. 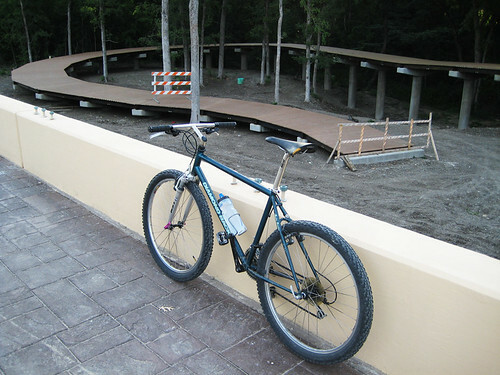 Well, this week, the road and ramp to the trail finally opened. It’s nice, but I can’t help but think that this is just the beginning of more development. I’m torn, because I like progress and having these big companies in our city to help with our economy. However, where do we draw the line between this progress and holding on to our parks and wildlife? Click Here to see a quick video of me going down it for the first time. Click Here to see the City Of Richardson trail map. Just so you know, Central Expressway is not an interstate highway, and is thus not called I-75. There is an I-75, but it runs through Georgia (and a few other states). The designation for Central Expressway in Dallas is US-75. Keep on biking! I think the new road is called Routh Creek. Thanks for the info folks!! I’ve updated my post to reflect the correct information. Also (to continue correction you! hahaha), BC/BS has been in Richardson for long time (unless they moved and I didn’t know it) down at Spring Valley and and Central. I’m glad they are staying. I don’t like the destruction of so much habitat, but we need to keep them here. Can’t wait to ride through the woods that way again. I knew they were in the Metroplex, just wasn’t sure where. For some reason, I was thinking more in Dallas. Thanks for the info, Bob. Did I miss anything else, folks? Anybody? 😉 I’m thinking that this is a nice little trend that I’m starting. I should keep blogging with misinformation in my post to get folks to comment. LOL. Maybe I can turn it into a contest. Well, I grew up in Richardson, but I just moved back here about 4 years go, after 15 years in Austin. So there are some things I missed (like development of the bike trail system). I ride all over town, remember “what used to here or there”. Sorta sad, in a way, but I like it. I remember BC/BS because when I got married in 1990, my recently college-graduated and grad-schooled wife tried to find a job there, and was unsuccessful. It was of course during a nice recession, and job were hard to come by, and when you found one it sucked! I hear further development is under proposition for this beautiful park. I’m ready to take a stand as this area (Renner/Plano Rd/Central Expwy) is a huge asset to Richardson. It is one of the most beautiful parks in all of Dallas…full of trees, bridges, creek, trails and wildlife. If anyone has information re: development plans and who to meet (city council members or companies execs) regarding saving this park, please reply. I’ve been trying to follow this. I thought the development was proposed to go in the area north of Renner, south of PGB, east of Central and west of Plano Road. This would keep Spring Creek Park untouched. As of now, you’re correct. However, I understand talks are underway for the area south of Renner (I believe it’s referred to as Spring Creek Trail) – west of Plano Rd…the wooded area with trails, creek, bridges etc. I hope to acquire more info. There is a council meeting at Canyon Creek Country Club this Wednesday, Feb 9 at 7:00pm (or 7:30). It’s to meet the members but maybe they will have more info. If I have a chance to attend, I will update you. Thank you for your response and let’s keep on top of this! There is a part of the Spring Creek area, just north of the Spring Creek Trail and south of Renner that has been privately owned and has always been at risk for development. There is a fence along the SCT that indicates this division of property. Everything south of that fence (including the Spring Creek Trail) has been zoned as park. I’m not sure about the area west of Routh Creek Road. There is already some development as well as DART property. 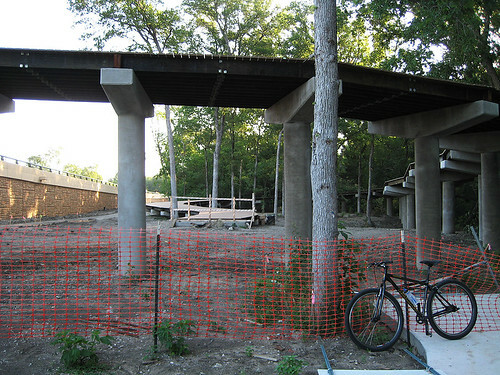 You would have to think that the millions of dollars that they are spending on the trail additions (under central) would keep those trail protected from further development. Keep us updated from your meeting. Thanks so much for the info. I will have to take a look at the areas you reference. Very good to know about the park zoning. The meeting was re-scheduled for March. Will update with any developing news. Thanks again!